Have you ever wondered how the inner components of a digital camera or computer could be manufactured with extreme precision? Such precision requires the use of a measuring microscope. Measuring microscopes are excellent tools used in research and development, tool making, and industrial manufacturing for precision measurements of 2D and 3D parts, angles, shapes, linear dimensions, screw threads, and diameter of objects, including holes that are too small for a measurement probe. Quality control and quality measurement are key steps in the manufacturing process and measuring microscopes are used extensively during this process. Measuring microscopes are also necessary for inspecting a variety of objects such as semiconductors, electronic and electrical components, precision components, resin moldings, and medical products, making it possible to measure specimens that are too soft for contact measurement. 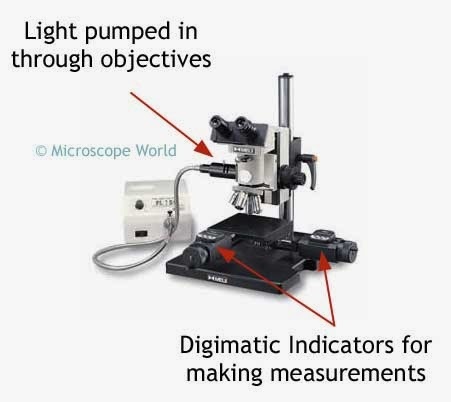 Measuring microscopes provide high power magnification and because the reflected light is pumped in through the objective lenses, opaque objects can be viewed. Some measuring microscopes also offer transmitted light from beneath the stage. The stage contains working room for larger objects, and the digimatic indicators allow for making measurements. Length measurement in Cartesian and polar coordinates. Angle measurements of tools such as threading tools, punches, and guages. Thread measurements such as profiling major and minor diameters, height of lead, thread angle, profile position with respect to the thread axis and the shape of the thread. Comparison of centers with drawn patters and drawing of projected profiles. Measurements of hardness test indentations. Known for its high magnification and suitability for shop use, measuring microscopes are well built for a variety of applications in the industrial market.